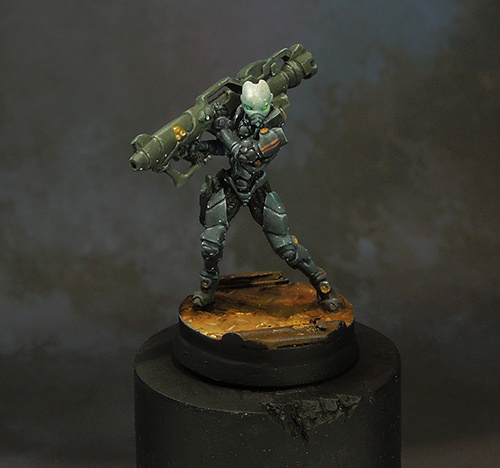 My first Infinity Miniature is ready for gaming, a Yu Jing Hac Tao with rocket launcher. I won't use her in the early games as she costs a load of points and we will start with games limited to 200 points. I decided to take her as test model on how fast I can achieve a result for my personal gaming piece that I am happy with. It took me 4 hours in the end and while I am writing this a step by step article about my work on it is in prep. I wish you two much fun with infinity. Its a very fun game. I like the colors you choose. Great job! I love it. Excellent results for 4 hours of work!